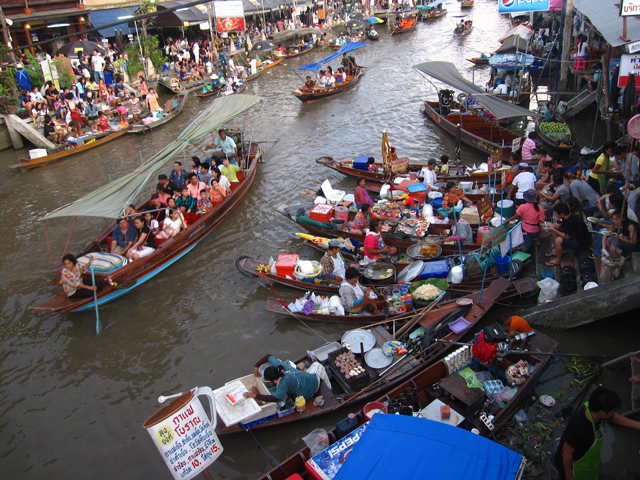 A floating market is a market that is located next to a body of water and vendors sell things directly out of their boats. Though some of the main waterways have since been filled in to make way for roads, Bangkok was once known as the Venice of Asia due to its extensive network of canals. Many people got around by boat, or even went to the market to sell their goods directly from their boat. What was once a normal way of life, floating markets throughout Bangkok have now turned into more of a novelty form of entertainment. Floating markets are located throughout Bangkok and the surrounding provinces, and they are extremely popular to visit on the weekends for both locals and foreigners. Nowadays the biggest attraction to a floating market in Thailand is the food that is cooked and served directly from a boat floating in the canal. The markets also offer plenty of random trinket shopping and are just good places to walk around. If you wish, you almost always have the option of navigating the market on a personal boat tour as well. Easily the most popular market with Thai locals, Amphawa is an entire neighborhood community that turns into a Disneyland-like floating market on the weekends. Tons of people escape Bangkok for the day and browse around the little stores and dine on the delicious food that is served from boats. I was truly impressed by the parking lot of boats on the canal and the way they served food rapidly to all the demanding orders! Don’t miss out on the grilled squid and the roasted shrimp! 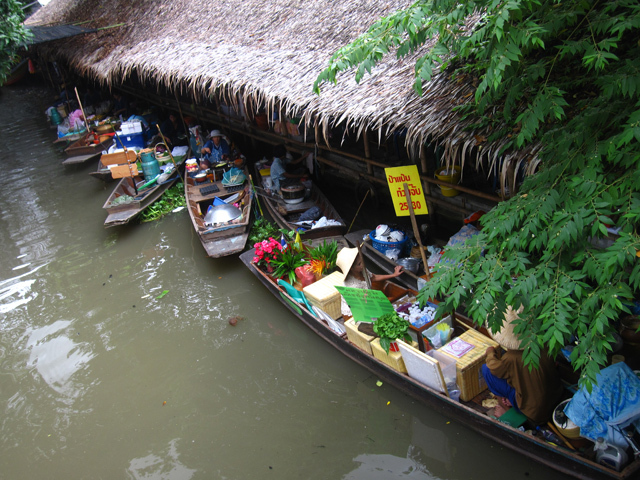 Located about 1.5 hours from Bangkok is the most popular tourist floating market in Thailand known as Damnoen Saduak. Over the weekend, hordes of foreigners flood the market on organized tours. Due to the massive crowds, and the over abundance of souvenirs, this is one of my least favorite floating markets. However, if you hop in a canal boat, you can still manage to escape most of the traffic and reach some beautiful tree covered canal areas. Do it on your own, or book a half day tour starting at $24US and go with a guide, click here to learn more. Located in southern Bangkok, Khlong Lat Mayom is probably one of my favorite market’s in Bangkok. It’s like a garden oasis, full of green trees, cool shade, and it is in a much more relaxed environment than the two mentioned above. Though there are plenty of shops and countless options for food, the market remains calm and low-key. It’s a great place to unwind, and partake in a lovely meal on the edge of the canal. Taling Chan is famous for its fresh selection of roasted seafood. If you show up on Saturday morning, you’ll see a bunch of tables filled with people devouring crab legs, huge roasted prawns and the all famous roasted snake head fish. Since floating markets are so popular throughout Bangkok, there are a few that have been recently set up to cater to the rising demand of people looking for leisure on the weekends. Bang Nam Phueng is located in an area of Bangkok known as Phra Pradaeng. It is a relatively new market that is yet another paradise for food lovers, and a relaxing place to walk around, take a boat, or just sit and enjoy the lush ambiance. When you visit Bangkok be sure to visit a floating market for the day! Great article. I didn’t realize that there were so many floating markets. Bangkok is a definite “must see”. just right now, i ma planning my two weeks in Thailand, checking all books and website I can find. This is the first time it is mentioned that floating markets are open on weekends only! Is it thrue? All of them? Nice post of Mark again. I will sure check out those markets except for the touristy one near Bangkok. Since nobody answered yet to Izabella. The one in Amphawa is worthwhile only on weekends. Because it is mostly for Thai and they work during the week. Nearby Amphawa there is one more called Tha Kha floating morning market. I enjoyed the boat ride throught the backwaters there much more than the market itself. I have an article on my site if anyone’s interested. I am going to Bangkok as part of my Honeymoon and would love to go to a floating market. What is the best time of day to go and roughly how long do we need? I want to go shopping, see the temples and floating market… all in two days… can it be done? Great article! I spent lots of time in Thailand as a young man working in the oil fields of the Middle East. The floating markets are great! The Thai people are amazing. I must see for anyone visiting this part of the world. I’ve been trying to find information on the small Thai market boats (I think they’re called Khlongs) that vendors sell their wares from on the canals. They are a beautiful little boat and I’d like to build one. I’ve only seen pictures of them, and I can’t find anything on the web about their construction. Any leads would be appreciated. Thank you. Very cool! 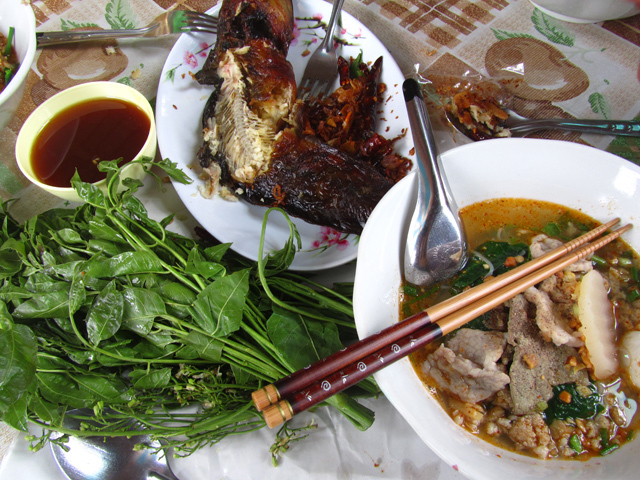 Reading about all these markets is making me hungry for Thai food- it’s the best! 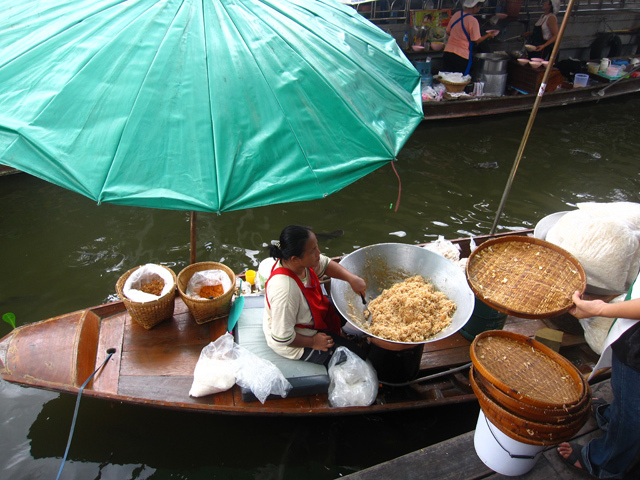 I’ve always wanted to visit a floating market! I am going to Thailand for the first time in October to start my travels so thanks for this. Wow man…I guess I missed this when I was in Thailand last. Damn! In such a market, I would rather be a seller than a buyer. Being a seller will be so cool…your own boat, own goods..and keep moving in water. Awesome. Hi Mark!Thanks for the article.It’s gonna be very useful :). I’m going to Thailand this October and i wanna know in what days takes place the floating market? I make a search before and i saw that the floating market only open on weekends. Is that true? When we were backpacking in Thailand, we never went to the floating markets. Oh well, all the more reason to plan another trip there. Will spend some time to come up with new ideas and places to see when we visit Thailand again next year. 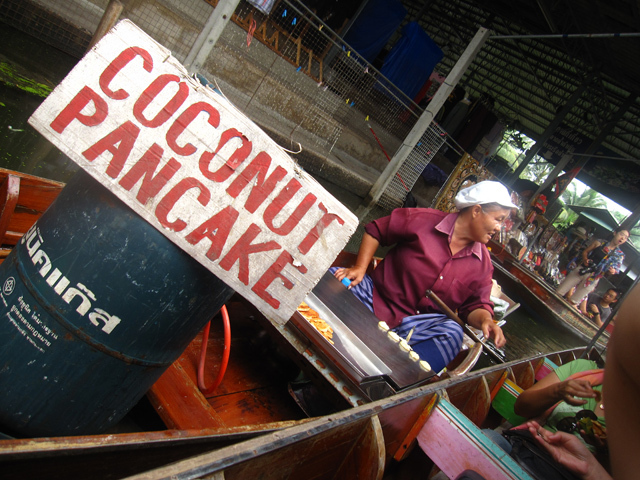 Yes Almost every traveler has a visit to a floating market in mind on his first trip to Bangkok. Some will succeed, but the large majority will be discouraged by the distance, the price of the tour and definitely the ludicrously early wake up time… who wants to get up at 5 a.m. while on holiday? But why even bother waking up so early when there are actually more than five floating markets around Bangkok open all day.Thanks for your information. Awesome guide, this will be super helpful next time I’m over that side of the world, thanks! Hi, as an animal lover, I’m really concerned what sort of live animals are sold at the floating markets(this will determine whether I visit or not) Would someone mind informing me please, thank you very much indeed. I have always find this floating market so very interesting. I haven’t been to there yet but definitely soon. This tips will be so helpful, thank you. I wish I’d found this post earlier… We were extremely disappointed by Damnoen Saduak market. Very touristy, even the fruits, which were sold, were cut into pieces for tourists, the water was extremely poluted :-/ Probably the worst spot we visited in Thailand. Great tips! Thanks! Planning to go to Thailand on a short term and definitely want to visit one of there beautiful floating markets. An interesting place to be honest. Thailand really offers some quirky places to visit. The “midlifebackpackers” are hoping to be in Thailand, Cambodia & Vietnam next month. Will be in Bangkok & these markets are definately on our list.